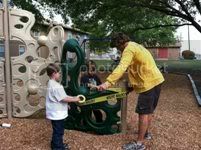 In 2011 Caring for Community partnered with Pecan Bend apartments to provide the children of their community a safe and fun play area on their grounds. After visiting the community a couple times and seeing all the young kids hanging around their "swing" the need was obvious. 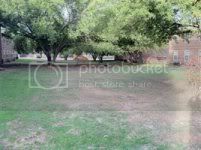 We met with some of the residents, talked with the complex management and proposed that we would do our best to raise enough money to upgrade their swing-set. Of course, if 2010 was any indication of what our support could bring we were hoping for a nice sturdy tubular swing set. Which would be a considerable upgrade from the set that was currently in place. By the time the tournament came around we had 34 teams signed up and a full day of events for both participants in the tournament, families of those participants and the families of the community. After all the tournament was complete, the bounce houses, snow cone and cotton candy machines were returned and the money counted we had nearly $6000 to put towards the play area for Pecan Bend. 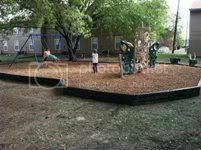 By doing the install with our own volunteers and working with local playground manufacturer we were able to put in a really nice area for the kids. On top of that by hosting the event on the grounds of the complex we brought awareness of the needs of those folks to others in our community. Since our event, small groups from a local church continue plugging in at the community. The high school youth ministry group from a local church spent their summer work week sprucing up the grounds by morning and leading mini vacation bible school in afternoon. We are thrilled at the support that we have gotten. 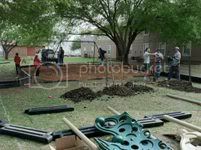 In the 2011 event we had 11 local business come along side of us to meet the needs of those in our community. We are so thankful for our friends that have helped us grow these events and the opportunity we have to continue hosting them.